I really love Italy; the country, the history, the people, the fashion, the culture, and not least the food and drink. One very civilised custom in particular that I am partial to, originating from the northern parts of Italy, is that of ‘aperitivo’. A great way to meet up with friends, Aperitivo involves having a delicious cocktail (traditionally on the bitter side) and enjoying some hors-d’oeuvres. 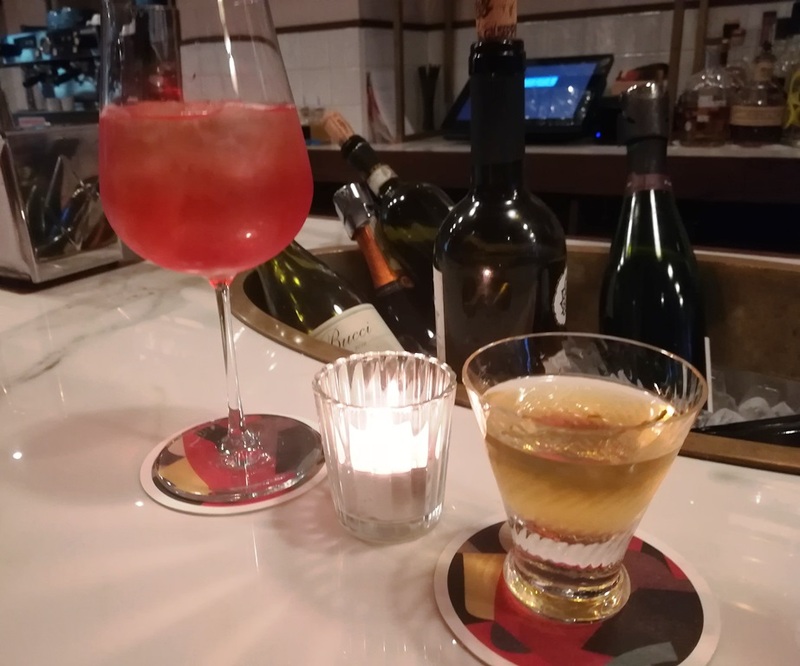 A little research reveals that Aperitivo originates from the Latin verb aperire which means ‘to open’; The rationale behind this is that the drink opens (or stimulates) your appetite. It may seem a strange concept starting your gastric juices flowing by indulging in a pre-dinner drink with snacks, but the Italians believe that the appetite comes when you eat. 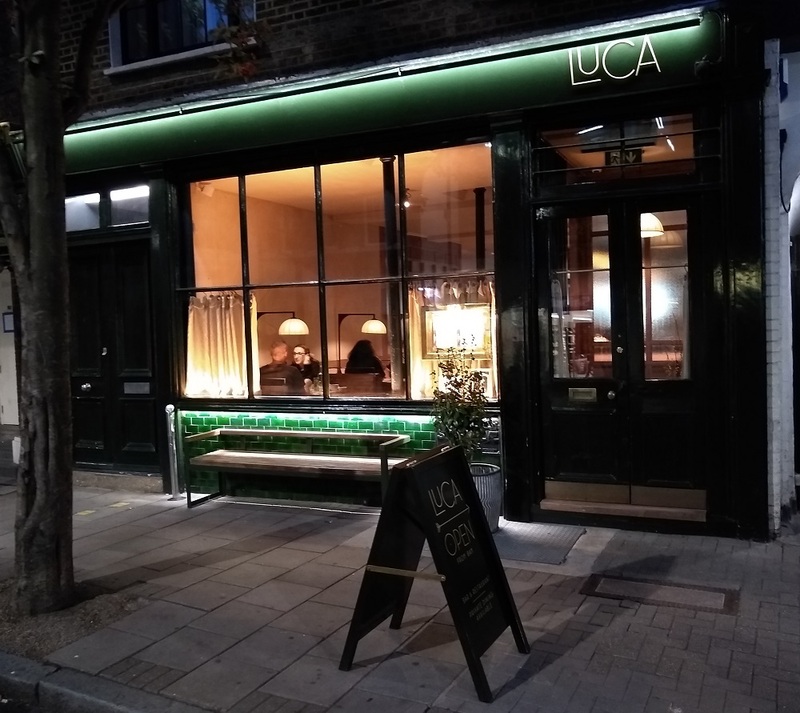 If you fancy trying this out for yourself, but staying in London, Luca in Clerkenwell is serving an Aperitivo menu until 4th October daily between 6 p.m. and 9 p.m. Luca’s Aperitivo menu is an English/Italian partnership between Luca’s Head Chef Robert Chambers and the Michelin starred Matteo Baronetto from Turin. Given that pedigree, we knew to expect a lot more than a few crisps and some olives! 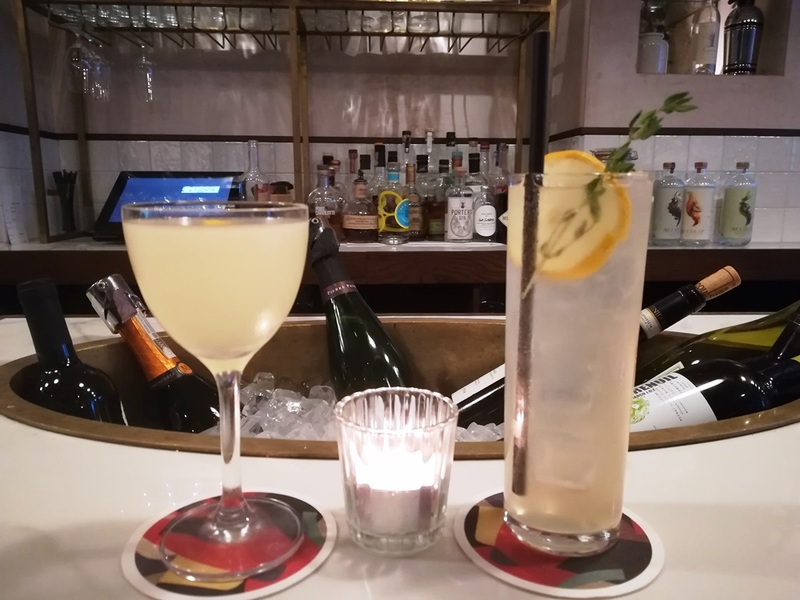 Additionally, the drinks have been co-created by Luca’s Robert Simpson and MARTINI’s Global Brand Ambassador Roberta Mariani. The bar area of Luca is beautiful and very comfortable, the perfect place for cocktails, snacks and chatting. (The restaurant area is separate and to the back of the bar). Perched high up on our bar seats we had a great view of our drinks being made by Robert, and we were able to bombard him with questions which he answered comprehensively and with good humour. 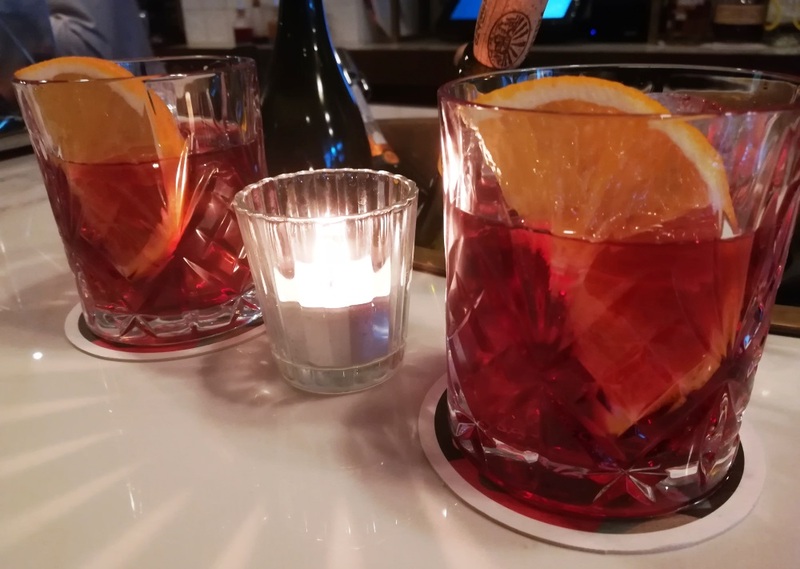 We both started with a perfect Negroni which was accompanied by 2 dishes. 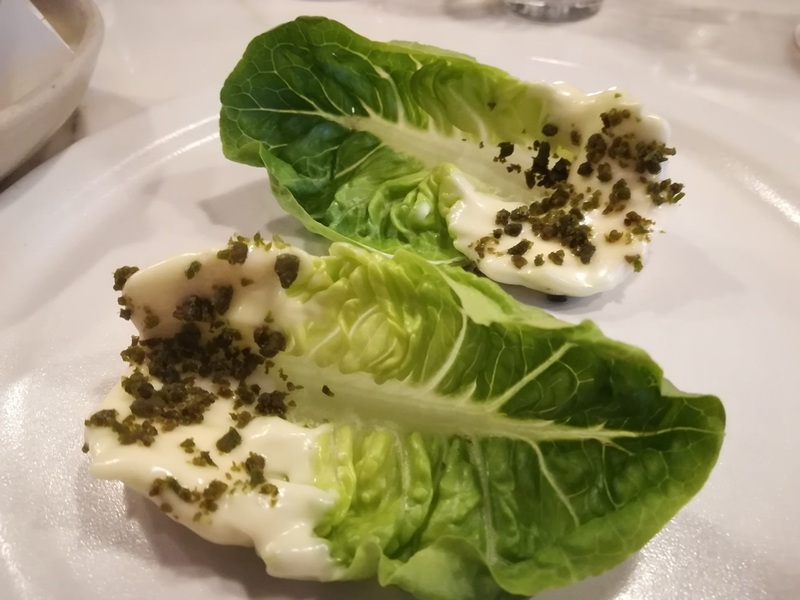 The first was a crisp gem lettuce leaf with citrus mayonnaise and dried green olives adding a little crunch. 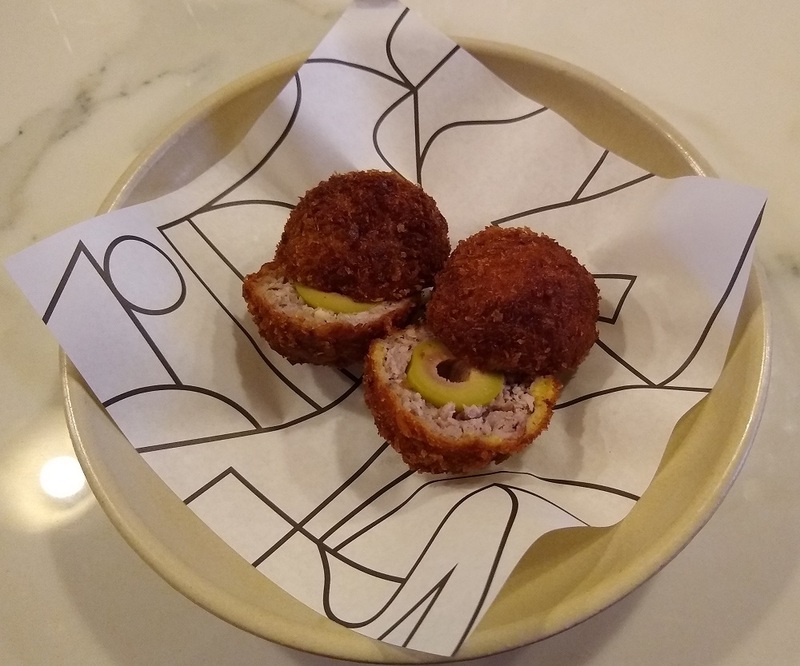 The second was described as a Scotch olive encased with rabbit sausage meat and coated in breadcrumbs. This was a hit with both of us, the slightly gamey rabbit meat and a hint of chilli providing a lovely contrast to the salty olive. In the interests of the review, we chose all 4 cocktails between the 2 of us. The Amalfi Spritz is a long way removed from the sticky bottle of Limoncello that we all seem to have lurking at the back of our drinks cupboards. This is made with Limoncello, but a herb soda complemented with MARTINI Riserva Speciale Ambrato vermouth perfectly offsets the viscous liqueur. This was a long, refreshing drink with only a tiny hint of sweetness. This is the perfect drink for a hot day. The Piedmont Fizz was served in a small wine glass, made with MARTINI Riserva Speciale Ambrato, gin, lemon juice Gomme syrup, and absinthe topped off with soda. This wasn’t as sweet as the Amalfi Spritz, and on balance I think that I preferred it. 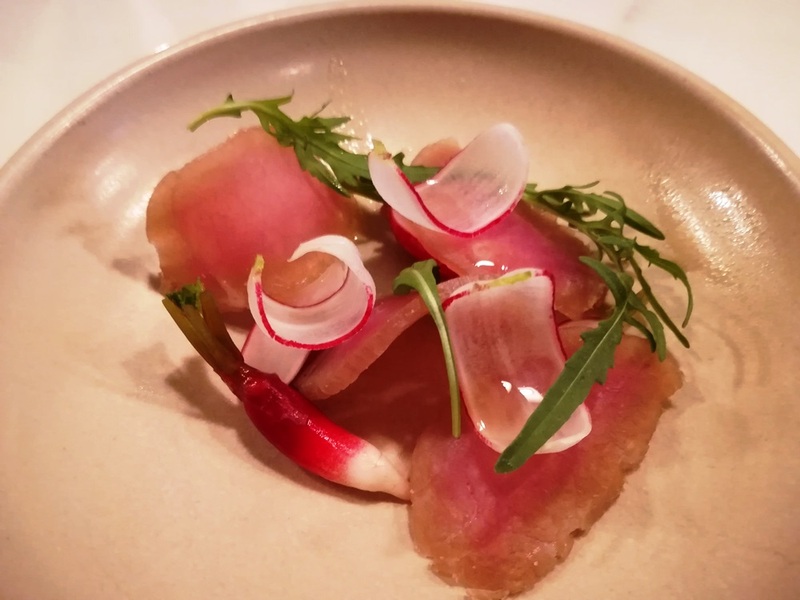 It seemed to pair particularly well with veal carpaccio marinated in chestnut honey served with delicious pickled radishes. 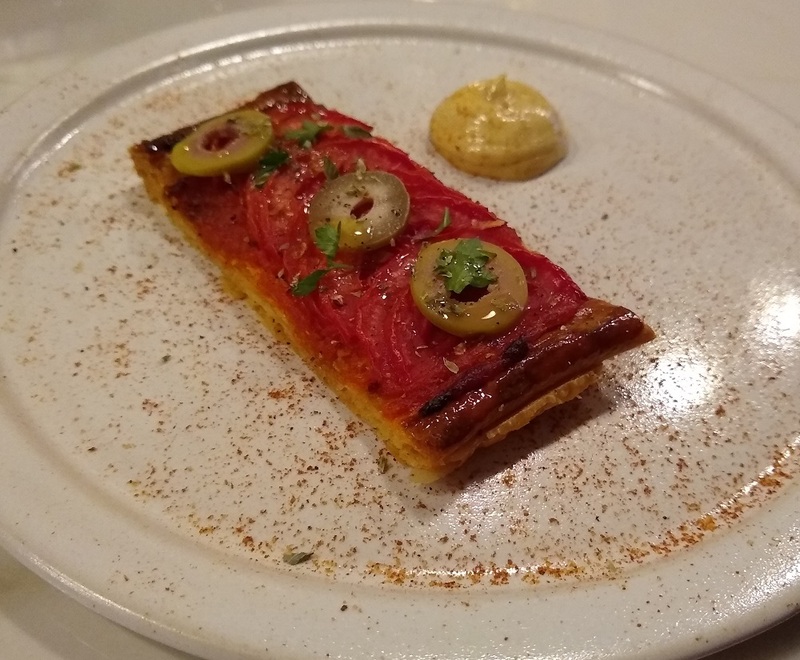 We finished our aperitivo with the final dish of tomato tart with salted green peach and gentleman’s relish. This was so pretty it was almost too good to eat. We did though, and loved it! 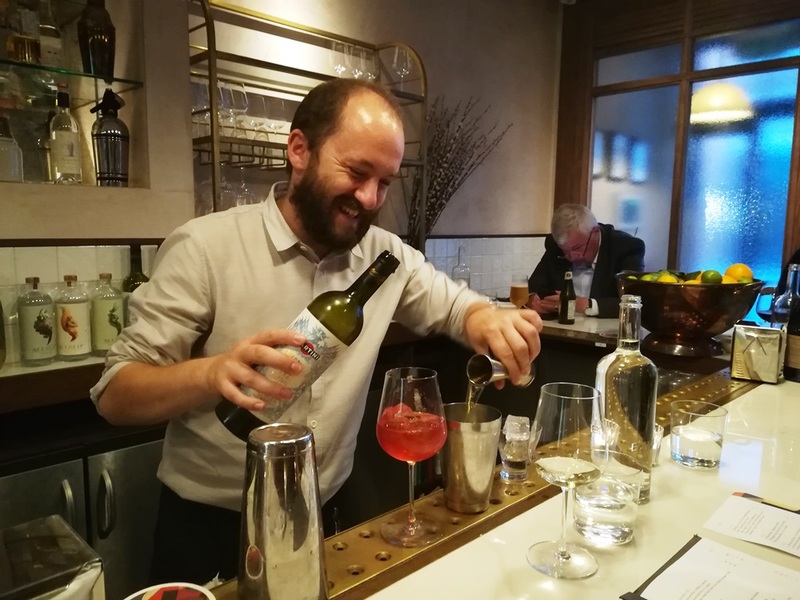 Our drinks were the San Pietro, an unusual mix of samphire-infused MARTINI Riserva Speciale Ambrato and tomato-skin infused gin. This cocktail is part of the move towards 50/50 martinis, as opposed to the gin being shown the MARTINI bottle! It was my favourite of the evening. Alex’s favourite was the Pedalare a MARTINI Riserva Speciale Bitter topped with a British perry. He said the aroma reminded him of a wet morning in an English orchard (in a good way). With our appetites well and truly stimulated we left Luca very happy. We hope that this trend is set to stay in London. Salute! For £35 a head you get the 4 dishes featured above, a Negroni, and 2 more cocktails of your choice – or you can just stick to the Negroni.